Continuing from the last entry, where I put Romans 7-12 in my own words, here are some observations. 1.) When Paul says that God’s promise hasn’t failed, his emphasis is not, “Because the Church is the true Israel.” (That’s what Replacement theologians tend to say.) Instead, his emphasis is, “Because the remnant of the Jews has come to Christ.” Even if you think the Church is Israel–even if you think Paul says so–it should be clear that Paul doesn’t depend on that idea here. His response is based on the remnant. 2.) Paul makes a big point of the fact that God did have a faithful remnant of some Jews. Apparently, if all the Jews had rejected the Messiah, God’s promise would have failed. So in some way, the bloodlines do still matter. It does matter for ethnic Jews to follow Christ. 4.) In some places in the passage, “Israel” can only mean ethnic Israel, not “believing Jews + the Gentiles”. As an exercise, try walking through all three chapters, and replace “Israel” with either “ethnic Israel” or “true Israel”. Try it both ways in each case. See which ones are clearly “ethnic Israel”. See which ones are arguable. Especially, let’s try that in 11:25-26. 5.) “Israel” shows up twice in 11:25-26. The first time is clear, but the second time is arguable. On the other hand, maybe it means, “every individual from true Israel (whether Jew or Gentile) will find mercy”. That makes more sense out of “all Israel”. And the basic idea of “true Israel” makes sense with the earlier stuff about including the Gentiles. And it makes sense with some other passages. But–I can’t make sense of it in the context. Who has been disobedient? Ethnic Israel. Who is Paul hoping will receive mercy? Ethnic Israel. If you read v. 26 by itself, maybe it can work. But it stops working when you hit v. 28. 6.) Last comment: Paul definitely talks about the Gentiles being included as God’s people, and he says they are “children of the promise”. Galatians also connects us with Abraham (Gal. 3:29). But what about the later Mosaic covenant? Maybe we’re included in Abraham, but not Moses. What about all the later promises that God didn’t make to Abraham, but made to Israel and the people of Israel? Do we have to be included in both? So, I don’t think you should take your final answer from Rom. 9-11. Even if it turns out that Gentile Christians do receive all the promises & covenants & prophecies to Israel, we would need to do more work to figure that out. We need to look at the various promises and prophecies, and look at what the New Testament says about them, and see what makes sense. In particular, we need to look at the land promises, and see what God specifically promised. And Jeremiah 31:35-37 is important. Back to “How do we interpret the Bible?” in general. Covenant theologians are right–that we need to let the New Testament interpret the Old, where it does so. And Dispensationalists are right–that we need to be careful about over-allegorizing, where the Bible doesn’t justify doing it. We should take it at face value unless we have good reason not to. That’s where I’m at. I need to study the Old Testament promises, and find out what the New Testament says about them. I have just one more comment about Israel and the Church in the end-times. But I’ll save that for another entry. A brief one. I promise. This entry was posted on Monday, August 3rd, 2009 at 12:46 pm	and is filed under Church. You can follow any responses to this entry through the RSS 2.0 feed. You can leave a response, or trackback from your own site. This is a great post and it deserves some reaction. I believe Paul uses the term “Israel” in Rom 9-11 to mean either ethnic or spiritual throughout these chapters and in each case its seem relatively clear which one Paul means, though most of the time when Paul refers to Israel I think he mean ethnic Israel. I disagree with your above point deeply. Let’s start at chapter 9:1-6. Paul grieves because his countrymen (ethnic Israel) have rejected righteousness by faith (Christ). And verse 6 is the key: God’s promise has not failed because “they are not all Israel who are of Israel”. To me it is very clear here that there are two Israel’s (true and ethnic) and since Paul begins his case with this point I think Paul is really emphasizing it. Paul is trying to get His readers to understand that his promises are for an Israel that is righteous by faint (true Israel), not by works (ethnic Israel). This is the only way that God’s promise cannot fail since ethnic Israel rejected these promise. Israel must be “redefined” or God becomes a promise breaker. To me this is the overwhelming point Paul is trying to make throughout these 3 chapters. I’m not clear what you mean here. Maybe you could clarify this. I wouldn’t say Paul makes a “big point” of this. Rather it is to further answer the smaller, secondary question He poses in 11:1, “has God cast away His people”. 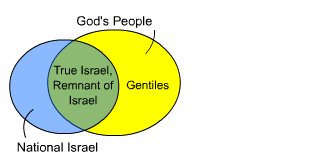 He brings up the remnant argument in 11:4 simply to say that, just as there was an OT remnant (comprised of mostly Jews and a few Gentiles) who did not bow their knee to Baal, there is a parallel NT remnant comprised of ethnic Israel and Gentiles who have indeed accepted the message of Christ. Therefore (to answer Paul’s smaller question) God has not completely rejected Israel since Israel in now taken to mean Spiritual Israel. I really don’t understand the conflict with the first Israel being ethnic and the second Israel Spiritual and the subsequent verses. They seem to fit very well with me and they are a logical and parallel conclusion to Paul’s beginning statement in 9:6. This is how “all Israel will be saved”. Paul says that a partial blindness has come on ethic Israel until the fullness of the Gentile has come in and so (or, in this way) all Spiritual Israel is saved. Wah-la, God’s promises to “Israel” are fulfilled. 26b and 27 fit nicely with this understanding. 28 would be understood to say, ”Concerning the gospel, ethnic Israel are enemies for the sake of Spiritual Israel (because of their rejection of Jesus and the spread of the gospel), but concerning the election (being saved by faith and not by works) they are beloved for the sake of the fathers (the good men of faith during the time of ancient Israel who waited patiently for the coming of the Messiah). V29 is, again Paul’s reaffirmation that No, God did not fail in delivering his promise to “Israel”. V30 is obvious to me. V31 tells us that God will pour out mercy on ethnic Israel in due coarse. V32 tells us that ethnic Israel’s disobedience resulted in mercy to all of us. If you read v. 26 by it’s self, maybe it can work. But it stops working when you hit v. 28. Replacement theologians are right–that we need to let the New Testament interpret the Old, where it does so. And Dispensationalists are right–that we need to be careful about over-allegorizing, where the Bible doesn’t justify doing it. We should take it at face value unless we have good reason not to. This is a loaded statement that needs to be hashed out over coffee, not email’s. I disagree with your above point deeply. Awesome! Seriously. That’s why I wrote this post–to lay things out on the table, so we can see where we’re disagreeing, and talk about why. For this comment, I’m just going to clarify something about the last thing you said, and ask you a question. we have good reason not to. Hmm… Interesting. I was actually trying to unload some loaded statements. I was talking about the catch-phrases that Dispensationalists and others tend to use, like I talked about in the first entry. In this case, I definitely don’t think you’re over-allegorizing. You’re looking at something in Romans, and you think it clearly tells you that all of the Church is included in “Israel”. Even if you’re wrong about Romans, you’re not allegorizing willy-nilly. So, dispensationalists accuse others of not taking the Bible at face value. But if the Bible tells us that “Israel” includes the Church, then dispensationalists actually have the problem. On the other hand, you want to be careful about doing that too easily. For instance–how does the church inherit the promises about the land of Israel being an inheritance? Is “the land of Israel” spiritualized to “the new heavens and new earth”? (That’s what people sometimes say.) And I’m just saying, “Be careful before you say that. Check what the promises actually say, and make sure that the New Testament really explains them that way.” If the promise seems to be about the land, what’s the specific reason for taking it differently? If this still seems loaded, we can talk about it later. And verse 6 is the key: God’s promise has not failed because “they are not all Israel who are of Israel”. To me it is very clear here that there are two Israel’s (true and ethnic) and since Paul begins his case with this point I think Paul is really emphasizing it. So, it sounds like you take Romans 9:6 to mean, “Not all of Israel is physically descended from Israel.” Is that right? Yes. I think this is the only way it can be taken…don’t you agree? OT Isreal unfortunately made it about bloodline or pedigree and works of the law which brought sharp rebuke from Christ (“don’t say Abraham is your father. If God wants to He can make children of Abraham from these stones”. Again a very clear statement about in not being about bloodline). Israel has always been a “catagory of people” not an ethnic group. Abraham was originally of some ancient ethnic group that we don’t know of and God called him out of that ethnic group and had him move to a new place. What made him an Israelite was his faith, nothing else. The same holds true for Israel today…nothing has changed. We are Israel because we hold to “righteousness by faith” alone, not works. That puzzled me at first–because look how it reads in the ESV: “But it is not as though the word of God has failed. For not all who are descended from Israel belong to Israel,”. The two don’t contradict each other. But they aren’t the same thing, either. By the way, this actually isn’t a disagreement in translation between NASB and ESV–NASB says the same thing, as do all the other translations. But NASB uses some awkward English. It says, “For they are not all Israel who are descended from Israel;“. If you insert the bold part back into “they”, it reads the same way as ESV. I’m not sure how this matters in Paul’s overall point. To say, “not all ethnic Jews are spiritual Jews” is true. Also to say, “not all spiritual Jews are ethnic Jews” is also true. And, both still seem to support Paul’s overall point. I think he is still saying, “God’s promises to Israel have been fulfilled. We simply need to understand who Israel is in God’s mind so that we will not stumble needlessly”. I am open to hearing other views on it but, for now, this is the only way to frame his argument without it sounding really odd to me. I’m not sure how this matters in Paul’s overall point. I absolutely agree that 9:6 is being emphasized, and that it’s the start of his case. But he’s not starting it the way that you thought he was. So it’s really important to step back and look at this with fresh eyes. When someone wondered whether the promise of God had failed (because so many Jews had rejected Christ, and were not receiving salvation), Paul did not start by redefining Israel. He started by pointing back to the way things always were–that there was always both the entire bloodline on the one hand, and the smaller, faithful remnant who carried on the promises on the other hand. You said 9:6 was being emphasized; this is what 9:6 says. This is what v. 7 says, and v. 8, and 9, and 10, and 11, and 12, and 13. The first part of Paul’s argument is spent talking about the history of the bloodline of Abraham, and how God always chose a smaller part of the bloodline to carry on the promises. So if that happens again, with many of the nation of Israel rejecting Christ, how can anyone claim that the promises of God have failed? I wouldn’t say Paul makes a “big point” of this. Rather it is to further answer the smaller, secondary question He poses in 11:1, “has God cast away His people”. But Paul didn’t introduce the remnant in 11:1. He introduced it in 9:6, and talked about it for seven more verses, and again in v. 27. If you agree about what 9:6 means, then you should agree that Paul did make a big point of it–because you already said 9:6 was being emphasized. I’m assuming that 9:1 is our beginning point for this discussion. In 9:1-5 I think that Paul is simply preparing his Jewish readers for the bombshell and potentially anti-semitic sounding statement that he makes in vs 6. He is saying, “hey, if anybody can say that true Israel is not just the “”physical seed of Abraham (v7)”" but they are people whom God calls by faith it is me, because 1), I recognize ethnic Israel’s rich and Godly heritage and 2), I am also a Jew. These two powerful points gives Paul the authority to claim that true Israel in both Jew and Gentile. This is also the place where I think that Gentiles are called Israel (though not directly). V7 makes this clear when Paul says “nor are they all children (true Israel) because they are the seed of Abraham (ethnic Israel)”. He is restating v6 in a different way. Children of God are not from the physical seed of Abraham but are from the seed of Promise (Isaac). Did I address your concerns from your last comment? Well… Not really. How is verse 7 any different from verse 6? They both seem to say the same thing: Just because you’re a physical Jew, doesn’t mean you’re part of true Israel, or a child of Abraham. In fact, verse 7 is worse for your view than verse 6. Because verse 7 finishes with, “Through Isaac shall your offspring be named.” Isaac only, not Ishmael; Paul is still talking about the remnant. Through verse 13, Paul is talking about the Patriarchs as examples of the remnant idea–God had made a promise about the seed of Abraham, but not all Abraham’s descendants received that promise. God chose a smaller part to carry on the line of the promise. That’s all he’s said so far in chapter 9. Paul doesn’t start talking about Gentile inclusion until verse 24-26. That’s the first place that comes close to what you’re saying. But even then, he says “my people” and “beloved” and “the sons of the living God”, but he doesn’t call us “Israel”. Then verses 27-29 go back to talking about Israel & the remnant. 1.) Paul distinguishes between physical Israel and true Israel. 2.) Being part of the bloodline isn’t enough. 4.) Verses 1-5 are at least partly intended to counteract antisemitism & pride toward the Jews. 5.) We Gentiles receive salvation & righteousness & inheritance as God’s children. All that is explicitly in Rom 9-11. Elsewhere in the Bible, I agree that we’re called children of Abraham, even though we’re Gentiles. I don’t know about “Israel”, but we’re at least called children of Abraham. I do not think Paul is speaking of the OT remnant (a small minority of OT Jews who remained pure and undefiled) in v7. He is speaking of NT true Israel which is Jew and Gentile. V8-33 is an explanation of v6-7 and culminates with v24 “even us whom He called, not of the Jews only but also of the Gentiles”. In fact, Paul begins v8 with “That is…” or “let me explain it another way”. The term “remnant” is mentioned in vs 27 and is used to describe both Jew and Gentile, not just the righteous Jews of the OT who were faithful. Both terms “Israel and Remnant” are undergoing clarification by Paul in these important chapters. Remnant is not to be understood as a smaller subset of undefiled Jews any more than Israel is to be understood as merely a bloodline or ethnicity. OK, you made a good point about verse 7. He hasn’t drawn out anything about the remnant yet, in that verse. I should step back from that. He doesn’t specifically draw out the idea of the remnant until verse 27. On the flip side, he doesn’t drawn anything about Gentile inclusion, yet. It think it will help us if we take a moment to clarify something for both of our sake’s: Which ideas are we getting from which parts of the chapter? What’s introduced in the early part, versus how it’s fleshed out later? I think we can manage to agree on the meaning of v. 6-7, and then move on from there. Both verse 6 and verse 7 distinguish between physical and “true”. (Between physical Israel and true Israel, and between physical seed of Abraham and true children of Abraham.) If we’ve just seen those two verses, all we know is that there is such a thing as “true Israel”–he hasn’t said that true Israel is the remnant of faithful Jews, and he hasn’t said that true Israel is all faithful people. Do we agree on that much? If so, we can start there, and I’ll reply to what you said about v. 24-26. Yes, that’s a good summary. I will wait for your reply of 24-26. My reply will be forthcoming, but I’ve gotten busy. I can tell you what part of it will be, though–pointing back to what I already said about 24-26. It’s been a few weeks–sorry about that. I’m going to recap, to refresh our memories. So, let me recap just a little more. In fact, v. 24-26 talk about the Gentiles–but then v. 27 goes back to talking about Israel and the remnant. 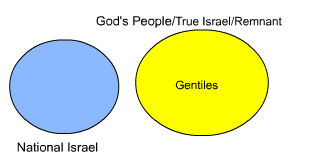 We do have Paul talking about Gentile inclusion, but not yet saying anything about inclusion in “Israel”, as opposed to “the people of God”. He could have said that here, but he hasn’t, yet. I know you disagree about the connection between v. 24-26 and v. 27. But bear with me. Paul starts talking about the Gentiles in v. 24-26. He says that they are called His people, beloved, and sons of the living God. Question 1: In v. 24-26, do you think Paul has now called Gentiles “Israel”? My answer would be, no–he hasn’t used that label yet. You would have to assume that if God calls someone “His people,” “beloved,” and “sons of the living God”, that this means He’ll also use the word “Israel”. And that’s exactly what you’re trying to demonstrate, not assume. If not that, maybe you’re getting it from v. 27. Question 2: When Paul goes on with v. 27, and talks about Israel, why do you think he’s saying here that Gentiles are in true Israel? He talks in terms of the remnant, which is already generally understood as “the subset/remnant of physical Israel who actually follows God”. If Paul is clarifying the concept of “remnant” to mean “all believers”, what specifically does he say to do that? He has explained that “God’s people” includes more than just Jews–please point to him explaining that “the remnant” is more than just believing Jews. The only thing I can figure is that you’re reading 27 as the parallel of 25-26. Paul did some Gentile-inclusion in 25-26, so he must be continuing that exact thought in 27. He must be doing more Gentile-inclusion. Why would you read it as continuing the same thought, instead of picking up the contrast from verse 24? Paul had just said that God called us from Jews but also from Gentiles. Then he quotes Hosea about calling Gentiles, and he quotes Isaiah about calling Jews. He quotes Hosea about naming Gentiles as His people, and he quotes Isaiah about saving only a remnant of the “sons of Israel” (who are as numerous as sand!–but only a remnant will be saved). I think a couple diagrams might help. I’m seeing things like the first diagram, and you’re seeing them like the second. But I can’t find anything in Romans 9 that points toward anything more than the first. Verses 6-7 didn’t, and I can’t see how verses 24-27 do, either. And at that point, you’ve turned “Though the number of the sons of Israel be as the sand of the sea, only a remnant of them will be saved” into “none of the sons of Israel will be saved”. Or you’ve turned “the sons of Israel” here into “true Israel”–but then what’s the remnant?